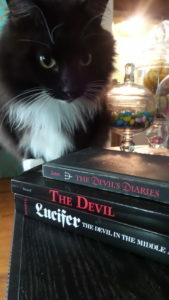 Matthew Lucifer is getting ready for one of his favorite holidays. October is a change of seasons for me. It symbolizes summer is indeed over and autumn is finally here. The warmer clothes replace the summer ones. Pumpkins are everywhere and the leaves are changing colors and falling to the ground. October is a bit of fresh air, a time that marks the beginning of the feast before the famine. We reach for everything sweet before we fill our bellies with turkey. Holiday parties grace our December calendars before the New Year begins and we start our latest diet. October is the sign of witches, werewolves and goblins coming out to trick or treat. This is the time when the supernatural comes out to scare us and Hollywood takes the front stage. Each year, I try to come up with a list of the scariest movies we should watch as we count down the days to Halloween. This year, I decided to approach this list a little differently. My task is to teach you a little bit about the classics of horror films by giving you a few suggestions on how you can expand your film education. Let us begin this journey with Alfred Hitchcock. I began this year’s scary movie binge by focusing on Alfred Hitchcock’s work. He has directed over 70 films. Known as the “Master of Suspense,” he did not always direct scary films. Back in 1928, he released a silent comedic romance called “The Farmer’s Wife.” It is a story about a farmer that decides to remarry after his daughter marries and leaves the farm. This tale is a complete comedy of errors as he goes from one woman to the next, before realizing the perfect wife was right under his nose the entire time. Nothing suspenseful or scary about it. Mr. Hitchcock did not begin his career with suspenseful classics until later. Suspense back then did not mean scary movies. They were usually mystery films. It wasn’t until later when Psycho came into being that suspense turned into terror. Psycho changed cinema forever. It “opened the floodgates” for screen violence. [How Psycho Changed Cinema] It is the first horror film, as well as the first slasher film in cinema history. Many horror films that follow pay tribute to Psycho. From the cinematography aspect of shooting in a “first person” perspective, rather than as a detached neutral observer, John Carpenter shot Halloween in that first person format where you can only see what the director wants you to see. He also chose Janet Leigh’s daughter, Jamie Lee Curtis, to star in the leading role. From the musical aspect, the shrieking violins during the shower scene made the crowd jump out of their seats. Stephen Spielberg used music as a way to scare his audience in Jaws like Hitchcock did in Psycho. As a result of Psycho, Hitchcock changed cinema forever. He followed Psycho with The Birds, another film that still scares people each time they look to the skies and see a swarm of birds. 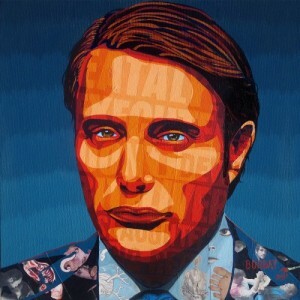 Mads Mikkelsen as Hannibal Lecter painting by Borbay. Commissioned by Michelle Kenneth. While Hitchcock changed the course of cinema, one film gave way to putting fear into our minds: the psychological thriller. The Silence of the Lambs was the first of its kind in that it gave birth to a new way to scare people…by getting into your head and letting the fear take hold of you. There were no jumping out of your seat moments. They planted a seed of terror in your mind and let it grow. Unlike most horror films, this film contained a few elements that made this movie unique. When Jodie Foster read “The Silence of the Lambs” by Thomas Harris, she knew instantly this movie had to be brought to the screen. She made a few calls and her project was underway. Because, you see, when Jodie Foster calls about making a film, you not only take the call, you make the movie. That Oscar gives her a lot of clout in Hollywood. The reason why Foster wanted to bring this film to the screen was because there has never been a female heroine that saves the day. In thrillers and suspense movies, men are always the heroes going in to save the damsel in distress. What if, for once, it was a woman that came in to save the damsel in distress? That is why she wanted to make this movie. Jonathan Demme directed the film (he died of cancer this past April). His vision created a brilliant masterpiece that will forever be heralded as one of the best movies of our time. Because of his genius, The Silence of the Lambs went down in history as becoming the first thriller to ever win an Academy Award. And yes, as they were filming this movie, they had that feeling all along the way that this film was going to win. To add to the level of scary and creepy, a little bizarre and unknown fact is that Anthony Hopkins and Jodie Foster were never in the same room together. Foster said she was petrified and scared of Hopkins. He kind of creeped her out, so she never allowed herself to be in the same room with him. What a surprise it was to find out that Hopkins said the exact same thing about her (as to why he never wanted to be in the same room as her). Of course, you are thinking, “But when she interviews him…they are in the same room.” Technically, no. There was always a wall separating the two of them. The Silence of the Lambs won for Best Actor, Best Actress, Best Adapted Screenplay, Best Director and Best Picture at the 64th Academy Awards. It is the first and only scary movie to win an Oscar. A most noteworthy characteristic between Psycho and the character Hannibal Lecter is how the audience becomes sympathetic with the devil. Understanding the character creates a unique love and fandom, similar to what you see with Dexter. You are not sure why you like this evil person, you just do. There is a conflict that goes on inside of you. You know you are supposed to hate the bad guy, but you are strangely drawn to him and love him. Ghosts are a scary subject matter. Movies like The Uninvited (1944) gave way to the concept of the haunted house. Back then, ghosts, monsters, and the supernatural scared people, unlike today where it takes a lot of blood and gore (and lots of violence) to scare people. In 1999, a 29 year old Indian immigrant created a film that would turn the cinematic world upside down. M. Night Shyamalan released The Sixth Sense. What made this movie so unique was not just the plot twist, but the fact that there was a story within a story that you don’t realize is there until the last few minutes of the film. Shyamalan changed the way we saw supernatural films. His script for The Sixth Sense is #50 in The Writers Guild’s 101 Greatest Screenplays ever written. While Shyamalan has gone on to create other incredible stories, none quite compare to his breakout movie. Over the last hundred years, there are many stories that were created that truly scared people. What scared people in the 1920s is very different from what scares people today. From Mary Shelley penning “Frankenstein” to Bram Stoker’s “Dracula,” Hollywood has taken these stories of classic monsters and put them up on the silver screen. Before Tom Cruise and Brendan Fraser starred in The Mummy, Boris Karloff was the original Mummy. Filmed in 1932, Universal Studios released its third installment of Universal Monsters with one of its scariest monsters to date. Karloff’s role in monster films made him one of the scariest actors in Hollywood. Prior to The Mummy, Universal released Dracula (1931) and Frankenstein (1931). Karloff also played Frankenstein, the film that propelled him to stardom. With 205 movies to his credit, this man spent almost 40 years scaring the pants off theatergoers. Like Karloff, Bela Lugosi and Lon Chaney, Jr (The Wolf Man) were typecast because of their breakout roles in the monsters universe. They spent the rest of their careers making horror films. This year’s version of The Mummy is the start of The Dark Universe movies…a resurgence of the famous Universal Monsters. All of these films are remakes of the originals, films that everyone should see before watching the new ones. Watch the original Universal Monsters films before they are released as The Dark Universe: The Mummy, Bride of Frankenstein, Creature from the Black Lagoon, The Invisible Man, Frankenstein, Dracula, Phantom of the Opera, The Hunchback of Notre-Dame. Finally, I want to end with a couple of filmmakers that listed the films that scared them. You will be surprised at their list. Some of the movies, you just might be shaking your head in agreement. Here are the movies Martin Scorsese said scared him: The Haunting, The Isle of the Dead, The Uninvited, The Entity, Dead of Night, The Changeling, The Shining, The Exorcist, Night of the Demon, The Innocents, and Psycho. Guillermo Del Toro: The Haunting, The Innocents, Alien, Jaws, The Texas Chainsaw Massacre, and The Exorcist.